I was mentioning last week how Dad had lived in the street in Kelvin Grove his whole life, and had memories stretching back decades. Some years ago I asked him a little about it. There was a time when he would “clam up” and not tell stories like this, but when I wrote my family history, he realised I did really want to know more about life in the suburb. I’ve used Trove extensively to see if I could track down more information on what he told me. After starting this story I also had an extensive conversation with Mum to clarify some of the comments, and she also added information. So here are his brief reminiscences, with my own comments, or follow up research relating to it. Mum’s conversations last week are included in green. When I was young you could catch a feed of prawns down the creek (Enoggera Creek) and when it was mullet season, you could just about walk across the creek across them. When Pauleen was young we sometimes caught catfish in the creek. Perhaps the floods washed the creek clean in the earlier days considering there was more industrial waste going into it. Mum used to sometimes call Dad “Elastic Jack” when he started telling tall tales, like walking across the creek on the mullet. When Pauleen was a child, the mangroves were quite dense and the wretched lantana held sway over the creek banks. Hayes had a dairy[i] and willed all the land to the council for the public. 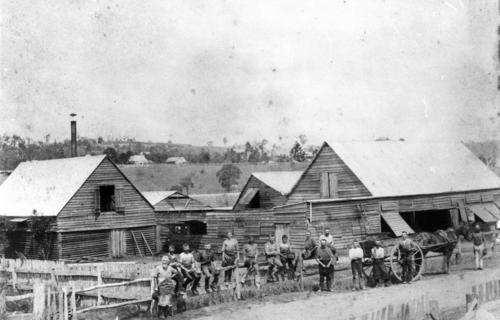 The dairy was located where the Mynor cordial factory was (at the bottom of Gould Rd). He used to run all the cows on Ballymore where the rugby union is now and a bit over the other side of the creek. The creek used to dogleg over the road and they cut it straight for flood mitigation. There was a weir over the creek across from Ballymore until they straightened the course of Breakfast Creek (technically Enoggera Creek) after the 1974 floods. The Commonwealth paid 60% and council and states paid the rest and the council was supposed to maintain it (presumably the land). It seems likely this was Henry Thomas Hayes as he’s mentioned in a Trove newspaper article as a dairy owner though the electoral rolls record him as a labourer of Gould Rd. The bakery (Hassetts) in Butterfield St, was a family bakery –it was there when Dad was twelve (mid-1930s) because he went over on the pushbike. In fact, in later years Dad and I would ride over to buy bread –the smell was heavenly and you would pull a bit out of the soft part in the middle…yum! Mum says this was often during the school holidays. Mum remembers that someone used to come around selling clothes props. There was a vegetable farm down where the NARM (sandshoes/sneakers factory) was, where the new Post Office depot is now. They used to call them Chinese market gardens. Mum says there was also one across the creek where it flooded as well as at Stafford. This is interesting because a health inspection refers to the terrible conditions of Chinese abattoirs in this area. Another dairy (was owned by) Hicks, where the baseball and Italian Clubs are now (in Newmarket, near where Pauleen used to go to Girl Guides). I was surprised to learn how many dairies were in the area, but it makes some sense in that pre-pasteurisation era. I still remember getting fresh milk from the dairy at Samford where we camped with Guides. On the flat opposite Bally St, another bit of a dairy, owned by a couple, McShea and Vowles. In Pauleen’s time this area flooded whenever the creek flooded heavily. Mum says there were also Chinese gardens there in her time. Mum also said that there used to be a horse track, with fencing, in the middle of Ballymore Park then in the 1950s every time you caught the bus there would be less fencing there, until it all disappeared. Hayes used to pick up all the old produce in Roma St. One day Dad saw him with the old big draught horse pulling the dray and he (Hayes) is asleep and the horse was leading the way. At the railway the horse went straight up, round the policeman, up College St and into the railway stables, while the policeman watched with all the traffic stopped. Johnston’s tannery was in Bishop St and there was one over in Finsbury St and another one where the retirement development is near Catholic church (in Newmarket?). This one was possibly Granlund’s. I remember the smell of the tannery quite vividly, but not pleasantly. It was okay except when the wind came from the west. 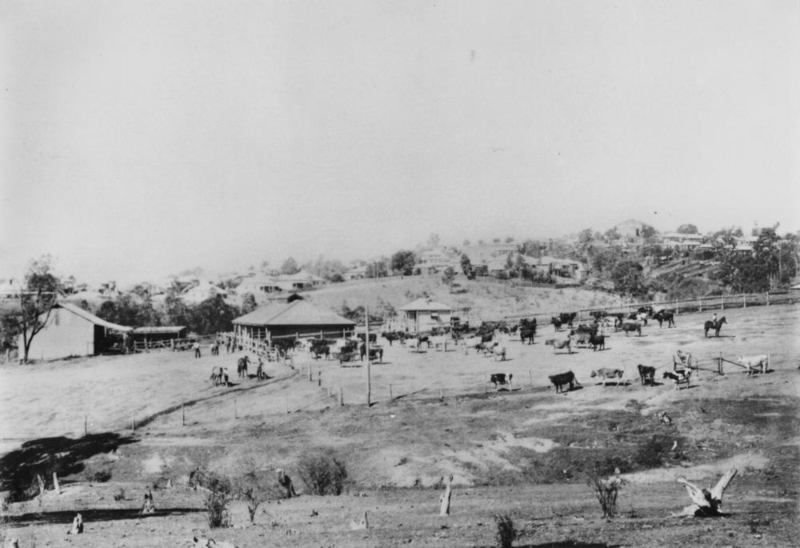 There has been some debate about these tanneries on the various websites but Queensland Places has this to say[iii]: Away from these public uses Kelvin Grove developed a landscape of Queenslander houses, most of them within half a kilometre of the tramline. Those further away were closer to Ballymore Park. Kelvin Grove Road had shops and a picture theatre (1912) (which Pauleen remembers). There were a couple of tanneries down Bishop Street near the creek, and the area is still industrial. Dad got in a row with the tannery and council because he couldn’t breathe – “they used to release all the muck from the tannery when tide went out. Sent a diver up the pipe to near Bancroft Park and it was that tannery that was putting the muck down the pipes so there was a big kerfuffle”. There was a big tannery at Stafford near where the shopping centre is (this coincides with a conversation on the web). 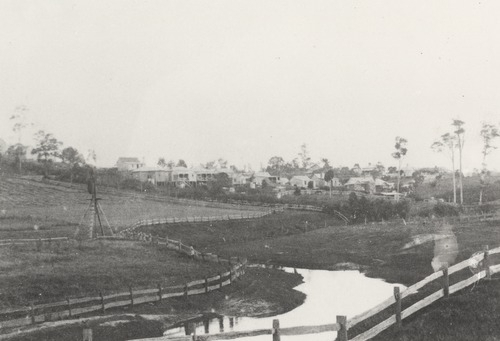 There used to be a beautiful swimming pool (natural) at Kedron Brook until the tannery came along. An 1873 newspaper article praised the Kedron Brook tannery owned by J & G Harris (I wonder if these were the same people who obtained the initial land grant on the Ballymore estate? )Or was the tannery that Dad mentions a different, newer one. Either way the Council took exception as this report indicates. A 1934 newspaper story takes a different view with one MLA wondering why the tanneries had ever been allowed to empty their waste into Kedron Brook. Finney (Isles) and Ure had a carriers where the garage is on Herston Rd (cnr of Kelvin Grove Road). There was a paddock at the endof Picot Street for the Clydesdales and they took them along the creek near the Chinaman’s gardens. via Trove: sale of property in 1929, large house in Herston Rd, one street off Kelvin Grove tram line. http://nla.gov.au/nla.news-article21373382. This follows Hubert Finney’s death –papers refer to him as ex-Alderman. He and Ure were members of the Master Carriers’ Association. Mum recalls that she was told euchre parties were held in the house across the road, to raise funds for the church and school. Perhaps these are not profound recollections but they add some personal flavour to the local history, and offer stories that would otherwise disappear. I’m just sorry I didn’t “pump” him for more. I also asked Dad who lived in the street when he was growing up and have since compared the names with those on the electoral rolls with great success, though he add some additional snippets to add. This may be the content of a post another day. My childhood friend still lives in the street behind ours and my guess is that her family has the longest continuous for the two streets, perhaps shared with one other family. I wonder if her father passed on any anecdotes to her? Trove Tuesday is a blogging theme created by Amy of Branches, Leaves and Pollen, revealing just how incredible a resource this is, even when making comparisons with oral history. 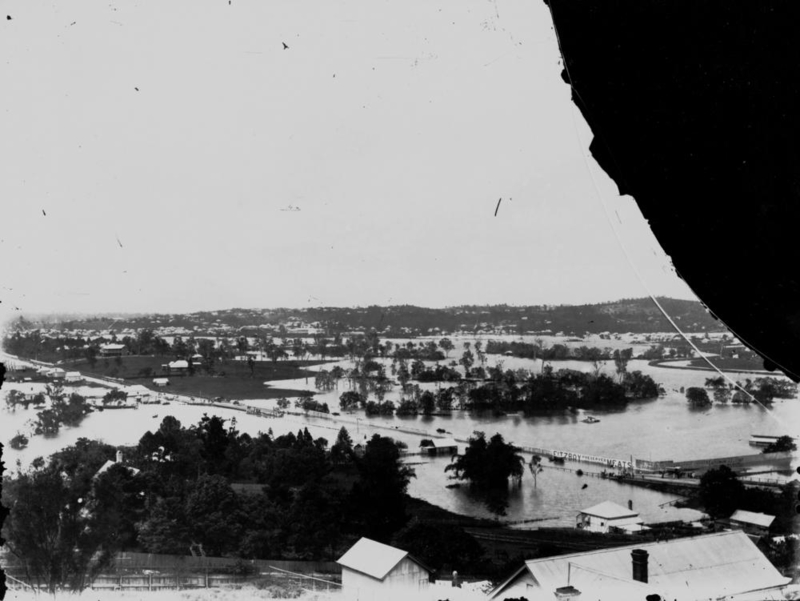 This entry was posted in Brisbane, Family History, Kunkel Family History, Trove Tuesday and tagged Brisbane, kelvin grove, Kunkel, memories, Trove Tuesday by cassmob. Bookmark the permalink. How great that you had the foresight to ask questions and now can compare the answers with what you know and your Mum’s replies… memories and interpretations are always interesting. I was certainly pleased I wrote those stories down – if only I’d encouraged more from him. I’ll try to get some more from Mum while in Brisbane. This is such a great way to tell the story. It makes me regret that I didn’t do it with my grandparents and parents and aunts and uncles. It’s so wonderful that you are getting your father’s story down. I also really enjoyed hearing my father tell stories about the old days. In used to live at 44 Bishop st, Kelvin Grove, right across the road from the tannery in the 60’s. Thank you for your blog. It brought back memories. I’m glad you enjoyed it Dot…not many of us wth that specific memory. It’s a small world isn’t it?